In your fork lies the future of oceanic species, so it’s time to know where your fish comes from: aquaculture, artisanal fishing and seasonally available catch are one way to go. You are what you eat. And that also means you’re responsible for what you eat, as chef Drew Deckman likes to remind visitors to his heavenly al fresco restaurant at Valle de Guadalupe, Deckman’s en El Mogor. Known for its ingredient-driven and regionally responsible cuisine, Deckman’s is one man’s adventure at trying to do honest, pretention-free cooking far away from the big cities, aiming to be “off the grid” from the heavy influence of corporate food industries. There’s no”organic”, “farm to table” and “sustainable” here. Drew prefers the word “responsible” for how he sources oysters, quail, wine, organic veggies, fish and other ingredients from regional farmers and fishermen. His wood-fired Baja Cuisine sources many ingredients from local fishermen and producers, including vegetables and lamb from the Mogor ranch, fish and seafood from SmartFish and other local, responsible producers, like Pacifico Aquaculture’s farm-raised striped bass or Baja Shellfish Farms oysters. Eating food sourced from local producers (instead of them exporting 100% of it to foreign countries) allows chefs, producers and everyone involved in the Baja food & wine industry to give back to the regional economy and help sustain Valle de Guadalupe’s delightful culinary scene. This is why eating responsibly makes all the difference, and why it is a central idea behind Deckman’s en El Mogor. It’s all about careful balance. Drew steers away from having fixed species on his menu, as that adds up pressure on fisheries (who concentrate efforts on high-value species) and fish populations affected by market demands (think salmon, bluefin tuna and others), and rather features the catch of the day. Who wouldn’t prefer a fresh-caught Baja yellowtail than a foreign fish from the other side of the sea? “The catch of the day’s definitely better, especially if it comes from a sustanaibly managed fishery, or even farmed. 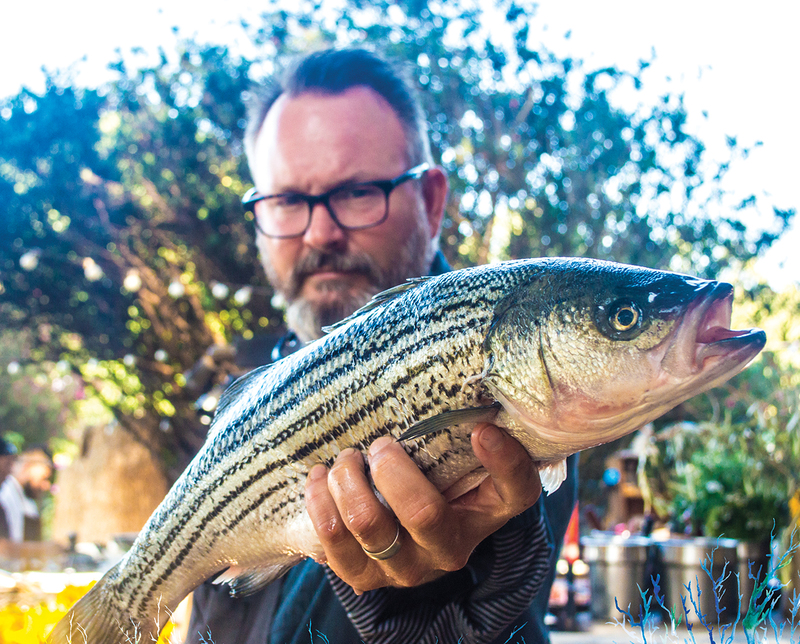 I like farmed striped bass, oysters and other fish that are seasonally available and sustainably caught, that’s why I‘ve worked with SmartFish. That’s why it’s important for people to know where their fish and food comes from. Tú eres lo que comes. Y por eso eres responsable de lo que te comes. Por ello es mejor comer en forma responsable, asegura el chef Drew Deckman, quien dirige el restaurante Deckman’s en el Mogor en Valle de Guadalupe, conocido por su cocina basada en el ingrediente local y sustentable. Sus hortalizas y borrego vienen del propio rancho El Mogor, y su pescado y marisco es de productores certificados como Smartfish, o bien, proveniente de granjas marinas locales, como la lovina rayada de Pacífico Aquaculture o los moluscos de Baja Shellfish Farms. Comer localmente ayuda a los chefs, productores y otros involucrados en la escena a aportar de vuelta a sus economías locales, y así poder crear paraísos culinarios como el Valle de Guadalupe, en lugar de que todo el producto de calidad se exporte a otros países. Es por eso que promover el consumo local y sustentable es una de las ideas centrales de Deckman’s en el Mogor. Drew se aleja del salmón y especies controversiales o en posible riesgo, y prefiere ofrecer un pescado de granja o la captura del día, porque eso ayuda a no saturar la demanda sobre una sola especie, como el atún aleta azul, por ejemplo.